Usually Yahoo! 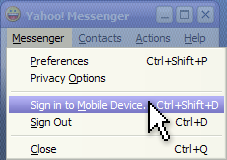 Messenger users leave their account open by connecting it to their mobile devices.To do this, you need to save your mobile number of the Yahoo! Messenger application so that it automatically signs in to the mobile mode after you logged out. Now what if you want to removed it and doesn't want to log-in on mobile anymore? Fortunately, I had this problem before and manage to solve this by the following steps.